Panoramic views from every room!! Imagine awakening to the sound of gentle waves breaking on the shore, pouring that first cup of coffee while watching a school of dolphins frolicking in the emerald green waters of the Gulf...IN YOUR PAJAMAS! Our condo is professionally decorated with an inviting, luxurious decor providing comfort for your vacation needs. 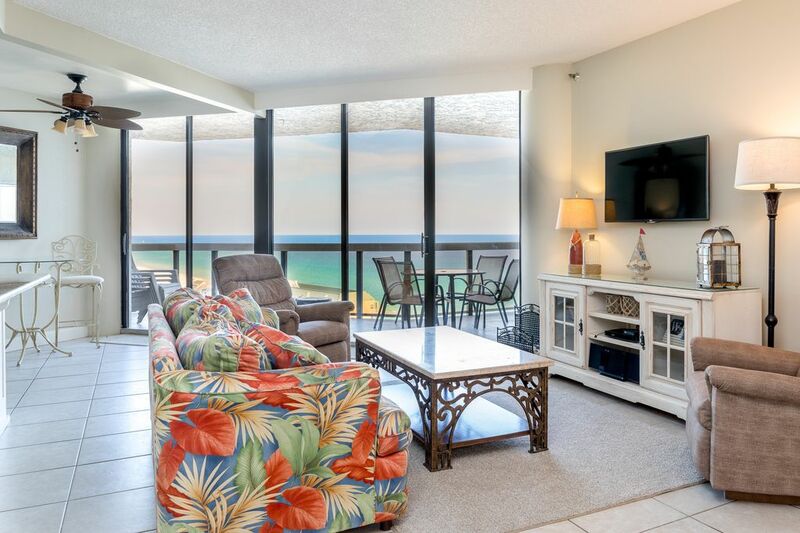 Our 2BR, 2BA CONDO (Unit 1205) offers a large Master Bedroom Suite featuring a Gulf view, lighted walk in closet, private dressing area, and more. The secluded second bedroom suite offers a Gulf view, two full sized beds, closet, and a full bath with bathtub and shower. All bedrooms open onto an enormous 28' balcony with incredible views of the Gulf, and at night, the Destin city lights. This is a lock-out unit which in plain English means the second bedroom suite has a separate entrance from the hallway. This allows guests a private, locked area away from the main living quarters...Great for sleeping kids or in-laws. Additional features include a fully equipped Kitchen, Breakfast Area, Living Room, and Dining Room.
' Wow! The views from your condo of the ocean, pool, and hot tubs is beautiful. We love the amenities at Surfside and the convenience to Destin's attractions. We'll be back!' Linda M., S.C.
WHAT MAKES OUR CONDO EXCEPTIONAL? * GORGEOUS WATER VIEWS AND BALCONY ACCESS FROM EVERY ROOM. * HUGE 28'BALCONY. COMFORT FOR THE ENTIRE GROUP. We are the Wertz family. Jeff, Lana, Ashley, Casey, Lexi, Mac (our beautiful black lab), and Paisley (our rescue). We live in Marietta, GA and consider Destin our 2nd home. Jeff is a residential contractor in Atlanta and Lana is a Certified Nurse Midwife. We have owned our condo for >16 years, and though we have traveled to other beaches, Destin is by far our favorite! We had been frequent visitors to the Destin area since 1989 when my husband Jeff was a navigator in the Air Force. We had never (and still have not) seen any more beautiful beaches in the world. We fell in love with the area and all it has to offer so we chose to purchase our beach condo and it is still as special a place to us today as it was way back then. There is no place as convenient and special as Destin, Florida. Our condo complex is a family resort. We have beautiful and spacious interiors where you have a great view from every room so you feel like you are at the ocean at all times because you are looking at it from inside the condo. Our resort has interior hallways from the elevators to the condo so it is like being in a hotel unlike most in Florida where you have to walk through outside hallways to arrive at your unit. The resort has a fabulous restaurant and tiki bar, a fitness room, spa, tennis courts, basketball court, volleyball court, shuffleboard, large pool, hot tubs, baby pool, etc. Our private beach is absolutely stunning and there are 2 chairs and an umbrella which we prepay to be set up daily for our guests to enjoy. We are centrally located so it is very convenient to all Destin has to offer but not in the center of it all where the noise and activity can be 24/7. We enjoy restaurants and activities within minutes from the condo and most often we are at the beach and pool that of course is right at our door step. Please bring cell phone. No phone in unit. Bring beach towels. Towels available in unit for showers but please do not take out of unit. The elevator runs from the foyer to the 12th floor. The unique thing is that all our hallways are conditioned interior like a hotel which is rare for Destin . Standard coffee maker. Please bring filters and coffee of your choice. No Keurig available. Fully furnished. Dishes, pots/pans, utensils, silverware. Newly renovated, granite, new cabinets, large island, small kitchenette, updated appliances. Blender available. (3) Flat Screen TV's in the master bedroom and great room & third tv in the second bedroom. Complex is wheelchair/handicap accessible. There is a ramp making access to pool and deck area easy. The doors in our condo are 2'8. Our bathrooms do not have railing or specialty units. There is a step up from condo onto balcony that is not wheelchair accessible. Great location and access to the beach. Owner was easy to work with and met all out needs. Would recommend to anyone. Beautiful condo, great location, awesome owners too! Great experience and spring break for our family. Highly recommend! The unit is very spacious and well appointed. The view is stunning, and the location allows access to so many wonderful restaurants and interesting haunts. The check-in process was smooth, and the owners were kind and responsive. I would definitely vacation here again...only disappointed that someone secured my vacation dates for next year already. You won't be disappointed with this property. If you need a break from the hustle and daily grind, this unit will situate you with a beautiful view of the calming sights and sounds of the Gulf. Thank you Kenneth for your thoughtful review! We are so happy you enjoyed your stay and welcome you back in the future anytime. Loved the view, the layout of the condo was good and the unit was well equipped. Hot tubs and outdoor heated pool made it a great stay! The condo is the perfect location for a quick girls trip. It is located near good shopping, restaurants and bike and paddle board rentals. The unit is nicely furnished with comfortable beds, a kitchen with everything you would need to cook full meals and a very comfortable living room. The view from the large balcony is always changing and beautiful. The restaurant in the building is convienent when you don't want to venture out for a meal. Lana is a very responsive and friendly host. We will definitely book this unit again. Thank you Laurie for your thoughtful review. We are so happy you enjoyed your stay and welcome you back anytime! Thank you Lana for sharing your condo with us! We had such a great time. The condo was clean and the owners were quick to respond. Hope to return next year! Outside your front door is Destin's famous sugar white sand beach ranked as one of the 10 MOST BEAUTIFUL BEACHES IN THE WORLD, The world famous Silver Shells Outlet Mall is located 1 mile away, great restaurants, jet skis, and water skiing are on-site or nearby. A wonderful aquarium called the Gulfarium, is located nearby with daily dolphin and seal shows which are truly spectacular, Legendary deep sea fishing and cruises of all sorts are minutes away, Pontoon and water ski boat rentals are great for enjoying the sand reefs on the bay, swimming in the clear ocean, and frolicking with family and friends.